At last, its here, the help most of us have needed to make the change from our overweight, under-active, out-of-shape selves to the ‘dream’ self we’ve always always aspired to be. Over the years we have been inundated with books and videos from fit people trying to help us be like them. we all know some fit people. They get up early to exercise. They are the first to leave the party and wouldn’t touch a burger at a fast food restaurant. These people have NOTHING in common with us but we continue to seek out and follow their advice to no avail. We fail with their advice over and over again! These people don’t understand you and that is why THEIR eating and fitness routines don’t work for YOU. This book is dfferent. The path to weightloss and fitness that Mark has experienced for himself is detailed in an enthusiastic, conversational manner, encouraging all of us to follow him on this journey of success. There are no magic bullets here. You can achieve your goals and feel a ssense of satisfaction while doing it, not becasue it will be easy, but because, this time, you will learn how to make fitness work for YOU. Pick up this book and begin your journey today. 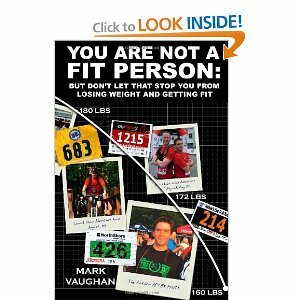 You Are Not A Fit Person: But Don’t Let That Stop You From Losing Weight and Getting Fit, is now available at lulu.com and will shortly be available on Amazon.com and as an ibook from Apple. I agree with you that you don’t have to be a fitness model to enjoy exercise and achieve your weight loss goal. However, if you watch what you eat, inlcuding the occaional junk food splurge here & there and you exercise regularly, you are a fit person. You don’t have to spend 10 hours a day at the gym with a diet exclusively comprised of chicke & brocolit to be a fit person. I get what you’re doing and I like it. Thank you. I think when you get it, you get it. The key is just helping others understand how to approach fitness in a way that will work for their life, for their whole life.